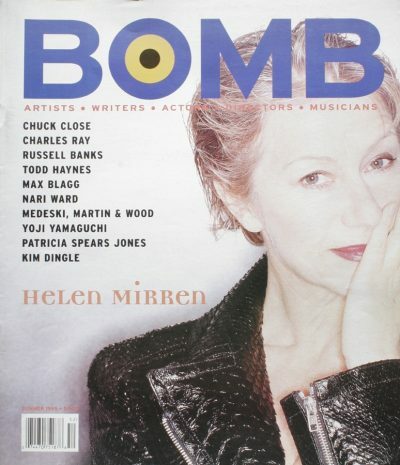 When BOMB Magazine started publishing artists’ and writers’ conversations in 1981 it was our intention to record the intimate and idiosyncratic, the urgent and the timeless — slices of the creative life that only artists and their friends get to see and hear. We wanted to catch the conversations about the process, the inceptions, the ideas, the comradery … and we wanted to hear them in a language as particular to their makers as their mediums: jazz, paint, poetry, film, fiction … BOMB’S contributing editors have grown from a handful of artists and writers to over 60 novelists, playwrights, painters, photographers, and directors whose own work and editorial choices reflect a community that crosses national and racial lines. Art has no boundaries. Neither does language. Our interviews reflect what RUSSELL BANKS calls, in this issue, a democratic language: “This big, crabby, wonderful, loving family of voices … a chorus of voices; it’s not officially classified as upper and lower or middle. The American language moves in and out, it invades itself. It converts and alters itself on an ongoing basis…” We couldn’t agree more. It takes time to hear another’s language, to ease into their drift, settle into their tone … and that’s what we do in our pages, let everyone speak and then listen real hard. As musician VERNON REID says about MEDESKI MARTIN & WOOD, together they make a sound that’s fun, funky, full of life — darkness and light co-joined. It’s in the spirit of this polyglot that BOMB is instituting a LETTERS TO THE EDITOR column next Fall so that the conversation will be continued. We hope that the editorial page will allow our readers to respond to the issues that arise in each of our interviews, fiction and arts projects. The real issues have never been the property of any one writer or artist. And it’s time for us to provide space for the vigorous and instructive written exchanges that have always marked the pioneering spirit of committed journals and magazines of their time. The editorial column provides an opportunity for artists cited in an article or an interview to clarify a point, or refute an invocation. And it provides a forum for compelling new ideas from readers, with a range of expertise outside the arts, to reflect on what BOMB’s contributors have to say. With this inclusive spirit at heart, we wish to welcome you, our readers, and your spontaneous and considered involvement.